Home Cultural project JoLabs JoLabs - Nosing around Jeiki-makey! To control a computer we’ve got a keyboard, mouse and...bananas? Plasticine? Pictures?! 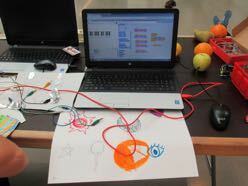 With Makey-makey we’ll get a quick introduction to programming with objects that we’d never have dreamed of using.